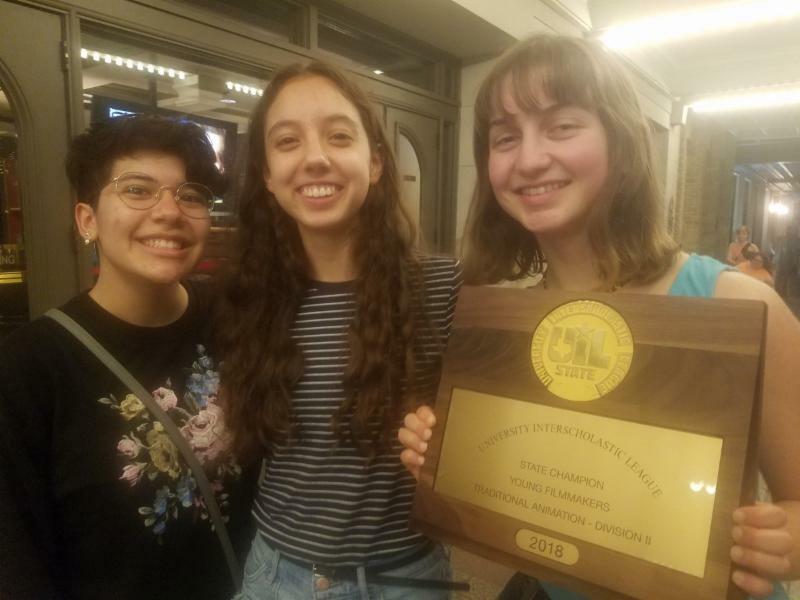 When the UIL Young Filmmakers Festival was held recently at the Paramount Theater, three films from Ann Richards School for Young Women Leaders made it to the state finals. Willow Daleheit earned the state championship in Division 2 for traditional animation for her film, "Sunflowers." This is the second year in a row that Ann Richards students have won the state championship in this category. Willow created her animation by drawing hundreds of pictures, scanning them and then combining those pictures with hand-painted watercolor backgrounds. Willow also wrote and performed the musical score for the film. Isabella (Izzy) Baladez and Samantha (Sammie) Seamon also attended the state finals and placed in the top six in state, earning an honorable mention in the division 2 traditional animation category for their film, "When it Rains." Jacky Ortega, Elly Garcia and Emily Garza placed in the top six as well, earning an honorable mention in the Nobelity Social Impact Award category for their documentary, "Para Mi." The Nobelity Social Impact Award recognizes films that inspire viewers to live a better life, encourages them to transform their beliefs or urges them to take action on important issues. Pictured: Willow, accompanied by Izzy and Sammie, holds her state champion award in front of the Paramount Theatre the night of the festival. To watch the films, please visit https://vimeo.com/annrichardsschoolfilm.